The smooth ribbon of asphalt is surrounded by a sea of waist-high beach grass and marked only by trailheads emblazoned with archways bearing the date 1805. Set your wheels on this 8.5-mile-long Discovery Trail and feel yourself floating along the undulating beach breeze. The smooth Discovery Trail gives you a great view of the beach on the Long Beach Peninsula. If that sounds like an ideal cycling vacation destination, plan to pack your panniers for a trip to southwest Washington this summer. And leave the car and rack behind—you can get out there on your bike loaded for camping (with a combination of ferry, rail and bus to quicken the trip). It’s an achievable adventure cycling trip for Western Washington cyclists, and part of the most popular long-haul course: the vaunted Pacific Coast bike route. As with most expeditions, getting to that relaxing trail on the Long Beach Peninsula is as much about the journey as the destination. In this case, it’s a three to five days of cycling fun. In my new book Cycling the Pacific Coast: The Complete Guide, Canada to Mexico, I provide turn-by-turn guidance, maps and insights into the southwest Washington section, along with the rest of the 1,900-mile route, and a dozen side-trip explorations. Briefly, I’ll recap my suggested route to Long Beach, with one caveat: it does not take you around the Olympic Peninsula. While that is a fantastic ride, and I’ve featured it as an alternate route in the book, my preferred route heads southwest from the southern tip of Hood Canal. Two choices get you onto the rural southwest Washington counties: Washington State Ferry to Bremerton or Amtrak to Centralia. From Centralia, cycle west through farmland on an easy ride to Elma, your first night’s stop. From the ferry dock in Bremerton, Elma is a pretty long ride, so you might make your first overnight at Belfair State Park, which has an inexpensive hiker-biker camp. On your way from Belfair to Elma, the town of Shelton provides a nice lunch stop. 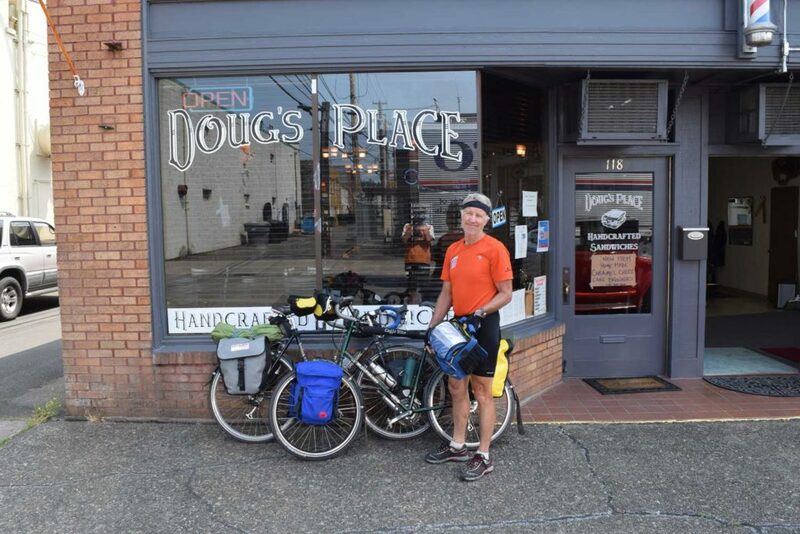 Where else in Shelton would you stop to have lunch when your cycling buddy’s name is Doug? BTW, great sandwiches! 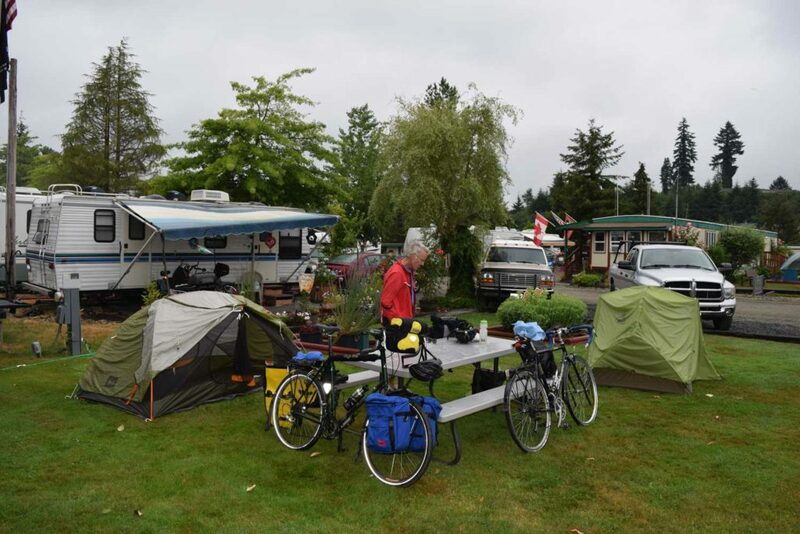 Doug and I set up camp on the lush lawn at Elma RV Park. Rusty steel cutouts animate the trail through the small logging town of Raymond. Strike out west from Elma along the quiet old highway to Montesano, then jump on the not-quiet Highway 101 to Raymond. If you’re energetic, take a detour to Aberdeen and see Kurt Cobain Memorial Park on the grungy banks of the Wishkah River. Enjoy the steel cutout sculptures enlivening the logging town of Raymond, which also hosts the west end of the Willapa Hills Trail. This paved, off-road bike trail will eventually, hopefully, be connected to that Centralia Amtrak station, but the bulk of the Lewis County rail trail is still in the planning and rough-gravel stage. Tonight’s campground is just beyond at Bruceport County Park, where cyclists get a price break and a private campground in the wooded hillside above Willapa Bay. 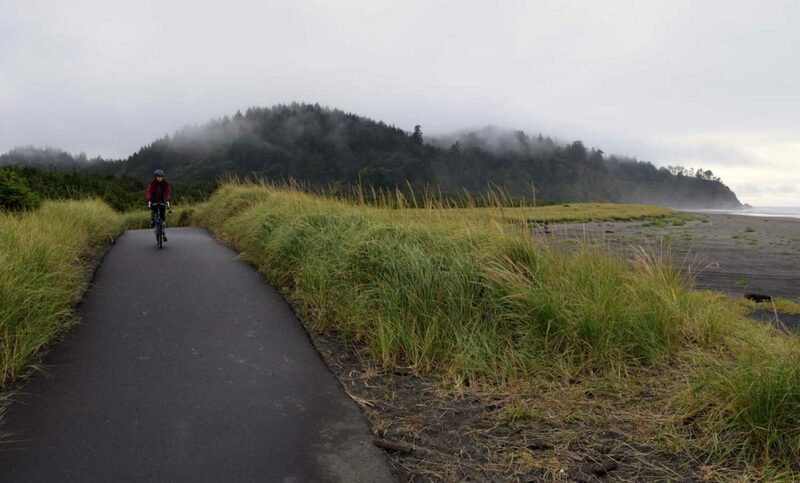 Explore the Willapa National Wildlife Refuge on the long, open road of 101 on your ride into Long Beach the next day. It’s light on services but heavy on scenery and wildlife. And the road has a consistent, painted shoulder for safe cycling. Long Beach and its neighboring towns deliver a classic ocean-beach holiday, kites to taffy to sand between your toes. They also offer plenty of motel and B&B choices (I like the not-fancy, family-run Mermaid Inn), but you can continue camping at the hiker-biker site at Cape Disappointment State Park, near the southern tip of the peninsula. This is the northernmost point of exploration for Meriwether Lewis and William Clark on their 1805 Voyage of Discovery, hence the trail name and the excellent Lewis & Clark Interpretive Center in the park. You might be tempted to retrace your route, but here’s another idea: cycle a few more miles into Astoria, Oregon and pick up the Amtrak-connected bus service to Portland, and from there, Amtrak Cascades to Seattle. It’s a short ride into Astoria, and you get to tackle the thrilling, four-mile-long Astoria Megler Bridge across the wide mouth of the Columbia River. Note: more than three of the bridge miles are flat with an adequate shoulder, but the slow climb to crest the iconic steel structure is briefly nerve-wracking. However, many drivers are used to cyclists on the bridge. The four-mile-long Astoria Megler Bridge is pretty flat until you get to the last half-mile. Plan to chart your own trail of discovery through southwest Washington. And if you’re really ambitious and have a couple of months free, try the entire Pacific Coast route. There’s a good new book out there to help guide your way. Hiker-biker campsites vary in price, but most are $5 to $15 per cyclist per night. No advance reservations are taken for these sites. Amtrak Cascades offers bike transportation in the baggage car and Northwest Point bus service from Astoria to Portland offers bike transportation in the bus luggage area. Advance reservations are required and there is a small additional bike cost per segment.